Polar bears burn more calories than thought. Can they survive climate change? The findings, described in the journal Science, reveal alarming facts about the polar bear's unsustainable physiology in the face of ongoing climate change. As human-produced greenhouse gas emissions continue to fuel global warming, the Arctic sea ice levels continue to shrink by about 13.2 percent per decade. At the same time, a number of polar bear populations have been on the decline — for example, dropping by about 40 percent in the Beaufort Sea in the course of a decade. "We've documented declines in the population, declines in the abundance, declines in the survival rates, declines in the body condition in the population," said lead author Anthony Pagano, a research wildlife biologist with the U.S. Geological Survey's Anchorage office. "And it appears to be related to changes in sea ice that are occurring." But understanding the exact relationship between the loss of ice and the plight of the polar bear has been a little murky because it's difficult to track the movements of these enormous apex predators in remote regions. "What we don't really know much about is, what are the actual mechanisms that are driving these declines?" said Pagano, who is also a Ph.D. student at the University of California, Santa Cruz. "We don't have a lot of information about really the basic biology and natural history of these animals when they're on the sea ice and how they utilize the sea ice environment." For this study, the scientists put trackers on nine female polar bears in the Beaufort Sea region. These trackers included accelerometers and GPS-equipped video cameras to document the bears' activities. From 2014 to 2016, they tracked the bears' movements for eight to 11 days in April, the beginning of the season when the bears are usually highly active hunters, putting on the bulk of the body fat that will see them through the rest of the year. To measure the animals' energy expenditure, they dosed the bears with doubly labeled water — water molecules whose hydrogen and oxygen atoms had been replaced with heavier isotopes with extra neutrons. The hydrogen atoms would leave the body in water (such as urine), as would some of the oxygen atoms. But other oxygen atoms would leave in the form of exhaled carbon dioxide (because water and carbon dioxide can easily trade oxygen atoms in the blood stream). The amount of carbon dioxide produced reveals how hard the animals are working. So by taking blood and urine samples before and after the observation period, the researchers could track how much the polar bears had been working. Researchers found that the bears' metabolic rates were an average of 1.6 times higher than scientists previously thought. That may be partly because the carnivores typically spend more energy than animals with herbivorous or mixed diets, pointed out John P. Whiteman of the University of New Mexico in Albuquerque, who was not involved in the study. "The high energy requirements of polar bears corroborate previous hypotheses that most terrestrial Arctic habitats, lacking prey as energy-rich as marine mammals, cannot provide enough food for polar bears driven to shore by loss of sea ice," Whiteman wrote in a commentary on the paper. That loss of sea ice is a grave problem for polar bears, which rely on the fat-rich seals found in a sea-ice environment. Arctic land animals have very little caloric content compared with these marine mammals. Getting stuck on land simply wouldn't keep these apex predators alive. "However," the authors wrote, "this rate of consumption would be necessary simply to energetically break even." The bears need to do better than that during the spring-summer season if they're to survive the harsh winter, the scientists said. It doesn't help that the loss of sea ice means that polar bears have to work harder to stay where the food is, Whiteman pointed out. 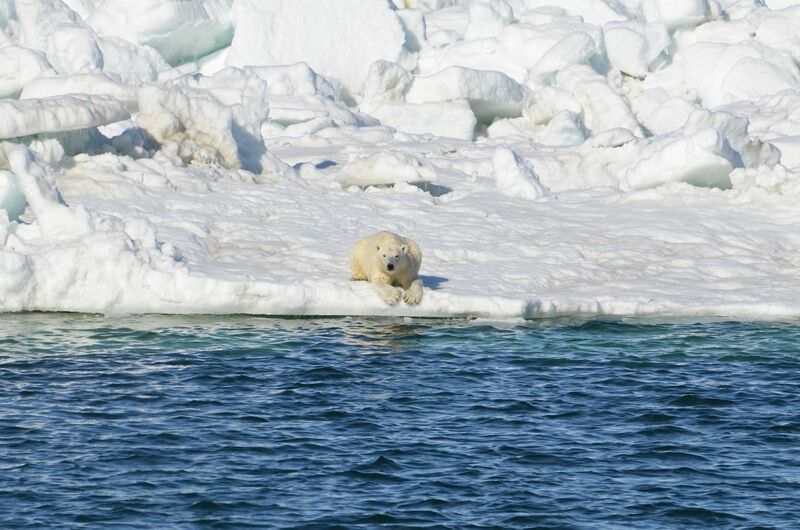 "Further, thinner sea ice drifts faster, and polar bears have had to increase their movement rates in order to remain in their preferred habitat, incurring higher energy costs," he wrote. Thanks to the metabolic rates documented in the new findings, he added, "these costs can now be modeled more precisely." Scientists once thought that polar bears should be able to reduce their metabolic rates when there's not much food available. The new study shows that's not the case. This means they quickly start to lose weight that is essential for survival. Four of the nine bears lost at least 10 percent of their body mass just in the days between blood-sampling events, and one even lost a significant amount of lean tissue (such as muscle). Considering that these animals typically weigh in around 400 pounds at this time of year, that's a lot of weight to lose so quickly. "To us, it really stressed the feast-or-famine lifestyle that these bears have," Pagano said. The findings put grim numbers to the reality that polar bears face as sea ice continues to retreat, researchers said. "Ice loss, if unabated, will eventually cause the extinction of polar bears in the wild," Whiteman said, "but continued research is needed to understand the climate-related pressures that polar bears face. Such data-driven explanations of the biological consequences of climate change are critical for public understanding and action."